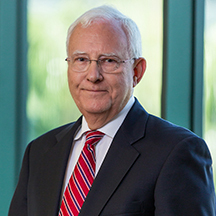 Richard Grant is a founding member of the firm and has practiced law in Southwest Florida since 1979. He has been board certified in real estate by The Florida Bar since 1987, and has an AV rating from Martindale-Hubbell. He has been listed in The Best Lawyers in America©, Florida Super Lawyers, and Florida Trend’s Legal Elite. He has been recognized as The Best Lawyers in America “Fort Myers Area Best Lawyers Real Estate Lawyer of the Year” for 2009, 2013, 2016, and 2018 and “Fort Myers Area Best Lawyers Corporate Lawyer of the Year” for 2011 and 2015. He received the 2012 Medal of Honor from Collier County Bar Association and in 2014 was recognized as the Citizen of the Year in Collier County, Florida.